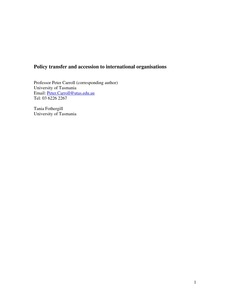 The aim of this paper is to examine the relationship between policy transfer and accession to existing international, intergovernmental organisations, focusing on the OECD. The main finding is that the process of accession reveals that it is a mechanism for voluntary but constrained policy transfer characterised by three basic stages, pre-accession, accession and post-accession transfer. It also finds that the significance of each of the three stages for policy transfer has changed over time, with a marked increase in pre-accession and accession transfer from the 1990s, compared to the 1960 and 1970s, when post-accession transfer was the norm. It concludes that accession to international, intergovernmental organisations is an important mechanism for policy transfer, complementing what is described as routine transfer.